Can you tell me how to get…the kids to clean their room? With this Sesame Street Multi-Bin Toy Organizer from Delta Children, of course! 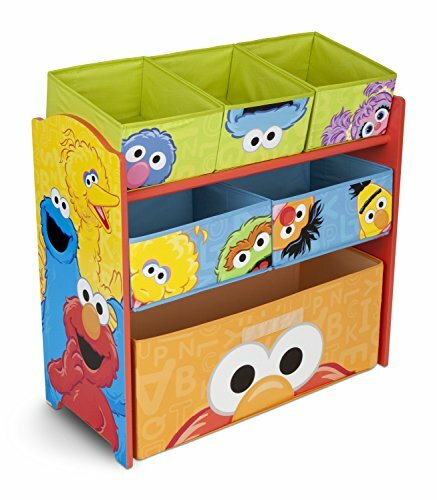 Supported by sturdy wooden frame, it features six fabric bins and colorful images of the whole Sesame Street gang. A fun option for easy organization of toys large and small, it encourages kids to clean up in record time. Delta Children was founded around the idea of making safe, high-quality children’s furniture affordable for all families. They know there’s nothing more important than safety when it comes your child’s play space. That’s why all Delta Children products are built with long-lasing materials to ensure they stand up to years of jumping and playing. Plus, they are rigorously tested to meet or exceed all industry safety standards.